Your HVAC unit has many components. It is a mechanical piece and needs regular maintenance just like your vehicle. Simple things like a dirty air filter can cause your system to leak. Improper or clogged drain lines can cause water to back up as well as the system being low on refrigerant can cause it to ice up and defrost causing water issues. A clogged condensate drain pipe can cause your drain pan to overflow, which is most common cause of water leaking. Drain lines can become clogged with dirt, ducting debris and algae. Over time with the vibration of your unit, fittings can loosen, which in return can cause the drain pipe to come disconnected or loose from the unit. Your system has normal condensate that will not drain properly and may drain through the ceiling or onto the floor. 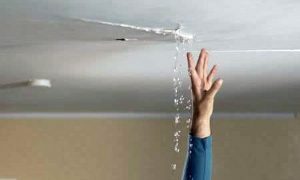 Where you may see water will depend on whether the primary or secondary drain pipe is the one affected and whether your system is located in the attic or closet. What steps can I take as a homeowner to prevent water from leaking? Make sure your system has a safety pan under the unit and your system has an overflow switch shut off which has a float attached. Make sure your system has a secondary drain line, and it is important if you see water coming out of it that you call a HVAC professional to come out immediately. Change your filters OFTEN. If you have pets, we recommend every 3 months. No pets, every six months should be fine.